My good lord, I’ve been gone a long time. Both of my blogs have been very neglected lately. I feel like I have no time to sit down and really write anymore. I figure I should be taking to the micro-blog Mondays as that would be a great first step to getting back here more regularly, but I’m not even sure that feels do-able right now. Things are good here, just busy! I am training for 3 half marathons scattered throughout a three month span (April 30, June 4, July 23) and that keeps me working out and focused. I’m trying to lift weights and do PiYo at least twice a week to stay strong and loose. I’ve painted another painting which will go in our bedroom once framed and I love it! I’ve been selling stuff on FB the last 3 days so that I can do it all at once and then be done for a while. Man alive, that takes a lot of time but is worth it – $975 in 72 hours. It’s hard not to do it when there’s that kind of money to be made. Hottie is traveling quite a bit right now which is fine but at the end of the day, I just want to sit and do nothing. The boys are doing great! Matthew is doing awesome with his speech and in school. He NEVER complains about going to school, something that truly amazes me after 2.5 years of going. Bryson loves school and also never complains, but that’s expected right now because it’s still sort of fresh and exciting. 😉 They are both signed up for camps this summer and Matthew is doing 8 weeks of it and I think Bryson is doing 5 weeks (he has to be 3 to go, and that won’t happen until the end of June). We are potty training Bryson and if he’s naked, he does great. There has not been a single naked accident even on the first day. but if you put undies or a pull-up on the kid, he uses that. It’s aggravating. My deadline is his first day of camp in July, so there is time. Matthew is into science and information in general, and Bryson is seriously into puzzles (I just ordered more from Amazon). Everything is great on the kid front! I’m scheduling things to succeed with my “Year 41 Plan” and now that I am 40 (oh yeah, that happened on St. Patrick’s Day! ), that plan seems a little daunting. HA! But I’ll stick to it! I’m excited about quite a bit of it, actually! Categories: Bryson, FB Selling, Matthew, My Free Time, Uncategorized | Permalink. Bryson has been an amazingly easy kid to put to, and keep in, bed. He tells us when he’s tired, asks for naps and bedtime, and sleeps 10 hours each night and 1.5-2.5 hours each day. Hottie has been suggesting for months that we convert his crib to the toddler bed so that he can get himself out in the mornings and I’ve refused because, “why would we do that? He doesn’t climb out yet.” I said we’d convert the crib once it became a necessity. Two mornings in a row, he’s shown up beside my bed asking to, “snuggle buggle in your bed.” I had him show me how he climbs out and he’s quite nimble, but I don’t want him slipping and falling off the rails in the dark (5:45, good god). So… I braced myself for hell and converted his crib. No hell. No hell at all. Hoping hoping hoping I’m right! Categories: Big Boy Room!, Bryson, Sleep | Permalink. Santa arrived at 2:23 this morning, with a fire station, a solar system, walkie talkies, and a massive supply of tape and sponge brushes in tow. These are BIG surprises, because the only thing requested in that list was the set of walkie talkies. Matthew explained to us that Santa makes toys out of wood – not plastic – and that they aren’t bought at the store. So… That made it super fun for us to get creative. Best Christmas so far by a long shot. Both boys are all in on the Santa thing! Categories: Bryson, Family, Holidays, Matthew, Seasonal | Permalink. I’m failing miserably at getting daily advent projects done – but we’ve got an every-other-day average going so I’m not going to stress about it. The kids are still having a great holiday season, so who cares – right? HA HA! 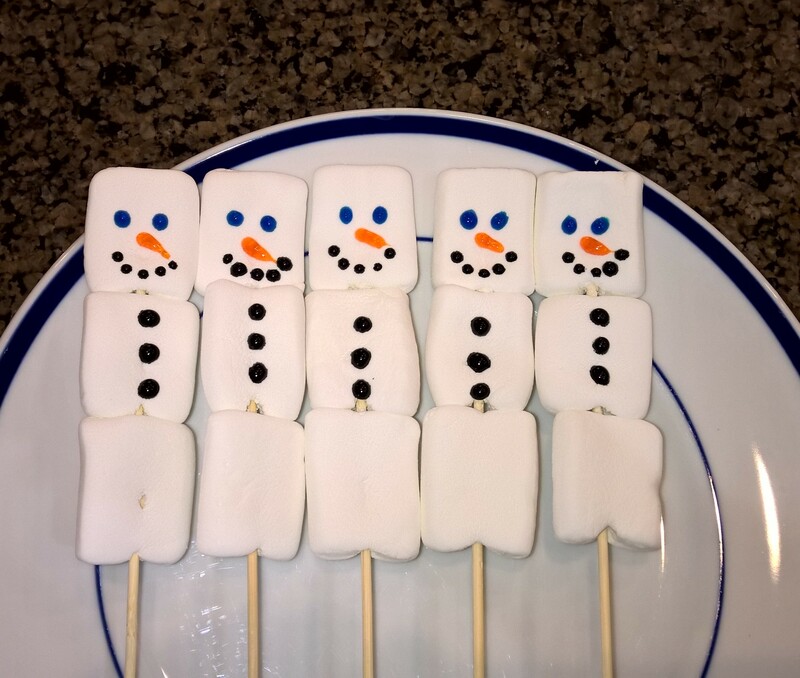 I found these cute little marshmallow skewers on William.s-Son.oma for way too much money and figured – what the hell – let’s make them. They were super fun and so cute! I should have bought regular marshmallows and not the stackers, but they still worked out and the kids thought they were awesome. Once they were done, Hottie informed me we had no milk for hot cocoa… so the boys just ate them straight-up. HA! Categories: Advent Project, Bryson, Family, FUN!, Holidays, Matthew | Permalink. It feels like I’ve been missing the holiday spirit for a long time. That’s probably because I have been. Ever since getting that call a week ago, it’s been hard to focus on the fun stuff. Our Advent projects came to a halt and we went into “fix-it mode.” Well, we couldn’t fix it but we could make things a little easier, and that’s all I can expect in such a situation. Tonight, we trudged forward with making paint-filled ornaments for ourselves, family members, and Hottie’s work friends. I did this project at Matthew’s preschool Christmas party today with TWENTY kids and it went perfectly! I planned ahead and had the drying cups with names on them ready to go, the ornament tops removed and bagged (and then taped to each cup), drying instructions written up for each child, the paints unsealed and ready for use, and Hottie employed to help me. It was so fun having Hottie there – he is so great with kids and with two of us helping the kids pick paints, shake them, and get excited about the end result – well – it was fun! 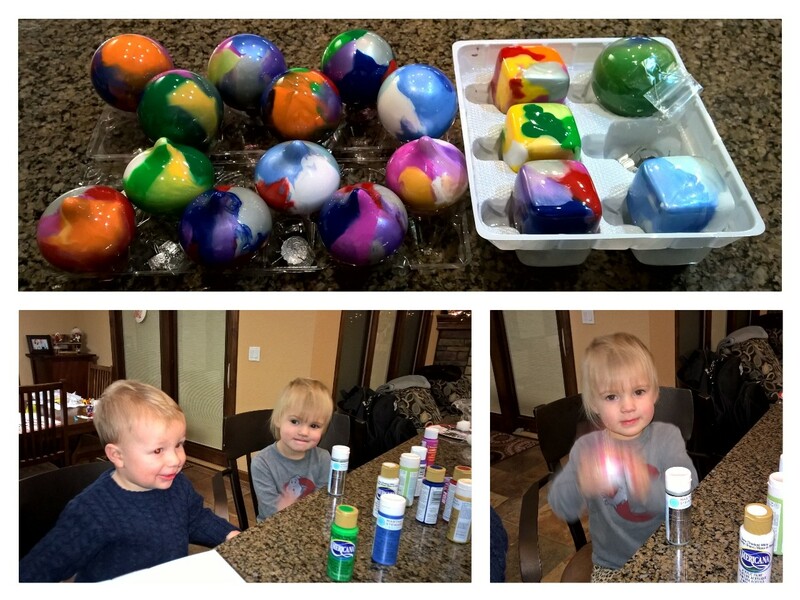 So much fun that I brought the boys home and we got to work on the GLASS ones for ourselves and loved ones. 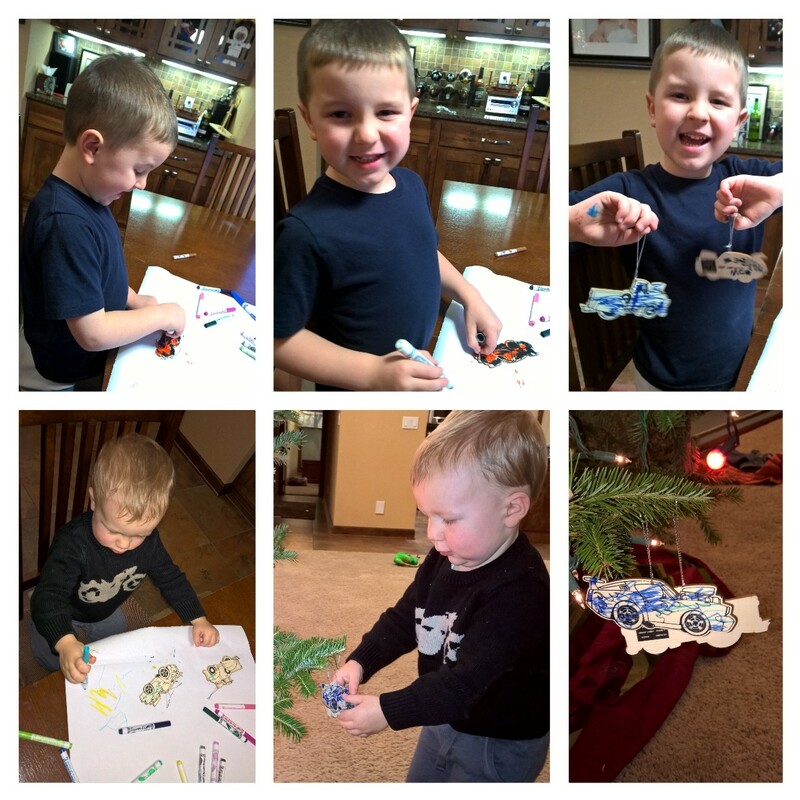 They had a great time making specific ones for Grandma, Grandpa, and SANTA (yes, we are leaving one out for Santa) and when Hottie’s friend’s daughter came over to hang with us for the night, we made some for her parents too. It was seriously fun! It’s been a rough few days over here, (which I’ll save for a separate post after this one), and I really needed some fun today. This project, believe it or not, brought me a lot of fun! The boys and I came home after an exhausting lunch together and got to work on a project I found today at Michaels. They cost $1.00 each, so I was super excited about them! Well… They were total failures. They look nothing like the picture and I should know by now that if it says, “glue needed” on the box, to PUT THEM BACK. The cheap materials used in these kits don’t adhere well to my favorite glue. I know this. Ha ha ha! The bear ended up looking like a llama because there is NO way to glue a relatively heavy ball on the side of another ball. It doesn’t work. So… Llama. I just had to laugh at this colossal failure! Categories: Advent Project, Bryson, Family, FUN!, Holidays, Matthew, Seasonal | Permalink.